For those of you who have been following my blog for some time now, you know that I am from Guyana. I grew up in Miami, FL for most of my childhood and was heavily immersed in the Guyanese-Caribbean culture. We had so many West Indian shops nearby and never went without the kitchen staples. I remember when I moved to Columbia, SC more than 18 years ago. It was major culture shock for us. Having access to my West Indian food items was pretty much non-existent. I depended on my relatives in Florida to send me stuff. We have one West Indian store here and the pickings are VERY slim. The prices are ridiculous and when I look at the expiration dates, you can tell the items have been sitting around for a long time. I have shopped around on Amazon and can't believe how expensive some of the most basic things are. I was lucky to get connected with a new business called Callaloo Box on Instagram. 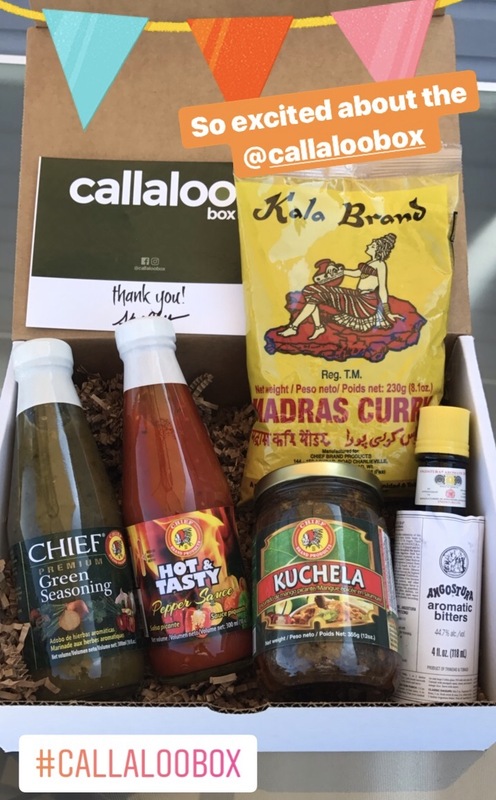 Callaloo Box is a new U.S. based subscription box service featuring seasonings, marinades, and hot sauces from the Caribbean twin-islands of Trinidad & Tobago. Trinidad is Guyana's neighbor and we use the same exact products for the most part. The founder and co-founders are 3 girlfriends who are all immigrants from Trinidad currently living in the U.S. and Canada. Their aim is to get these products into the hands of anyone interested in Caribbean cooking that live in the U.S. and don't have easy access to them, or anyone who simply loves food, cooking, and experimenting. This made me so happy! The September Callaloo Box did not disappoint! It came with 3 Chief brand products: Hot & Tasty Pepper Sauce, Green Seasoning, and Kuchela (mango chutney). Also a bottle of the classic Angostura Aromatic Bitters, as well as a package of curry powder. The pepper sauce is so spicy and delicious. It is the perfect addition for if you want a little hot kick to your meal. It tastes very similar to what my mom used to make. The green seasoning is similar to what I make which is a blended mixture of green onion, garlic, hot pepper, and herbs. It is so convenient to have it already made in a bottle so you can marinate your poultry or meat with ease. I also add it in soups and stews for extra Caribbean flavor. Kuchela is what Guyanese people call mango achar. It is shredded green mango with hot pepper, garlic, and spices. I remember my mom cooking achar on the stove top early on a Saturday morning, and all of our eyes and noses would be burning from the hot, HOT pepper. Now that my mother is no longer around, I'm happy to have access to it, without the tears. Every West Indian home has a bottle (or three) of Angostura Aromatic Bitters. What is it? : It is an aromatic botanically infused alcoholic mixture consisting of water, ethanol, gentian, herbs and spices. Although the product contains 44.7% alcohol by volume, each dash contains an insignificant amount of alcohol and therefore remains non-alcoholic. Suggested Uses: It is a well-known key ingredient in many alcoholic cocktails, but is also widely used to flavor non-alcoholic drinks, baking, and cooking. I personally add a few drops to certain savory dishes when I feel like it is missing something. It will balance out the flavors nicely. Also, I have learned that bitters never expire. This is good to know in the event you have had a bottle lingering around for a long time. Last item in the box is curry powder which is is a blend of turmeric, coriander, cumin, salt and spices. Growing up Guyanese, we curried everything under the sun from meats, poultry, vegetables, chick peas (channa) and even eggs. I have a new tradition that started this year where I cook curry every Saturday morning. The family really does look forward to it! One of the things I love to share with my family and friends is my passion for cooking. No matter what I'm making, I love to add my Indian-Guyanese twist into my dishes. I am so thrilled that I have access to my West Indian goodies via the Callaloo Box. I was quite surprised at how heavy the package was and it is a great value at $39.99 a month (cancel any time), or you can pre-pay a year for $419. If it sounds expensive to you, I challenge you to look up the products I listed above on Amazon and see for yourself what a value you are getting. Right now Mom Files readers can use the code: MOMFILES5 for $5 off of your 1st box when signing up for a month-to-month subscription. I am so happy with my first box and think you would be, too. Give Callaloo Box a try today! You can find Callallo Box here and please be sure to follow them on Facebook, Instagram, and Twitter for product updates, promotions, and sneak peeks into upcoming boxes. Please let me know if you decide to give them a try. I would never recommend anything I did not believe in. 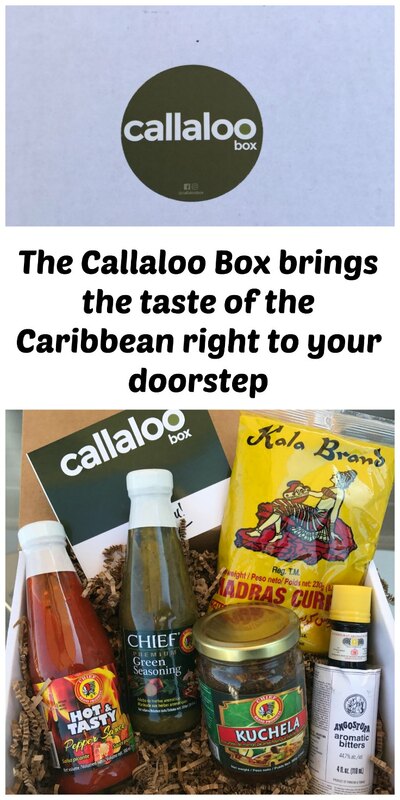 Thanks for stopping by today and big thanks to Callaloo box for providing a sample box for us to try. OK you're like me. I'm originally from the Caribbean but spent most of my years in NYC where I can get any and everything Caribbean. I moved to Colorado 6 years ago and there's absolutely NOTHING here. I usually get my friends and family to send me products, but this would eliminate them having to do so now. Thank you! !